The Keratin Treatment is an innovative process that transforms the hair in its entirety. The treatment is keratin based, keratin is the primary protein of the skin, hair and nails. This natural substance gives hair the ability to return to its original healthy, shiny, smooth state. Brazilian Cacau Keratine Streightener. 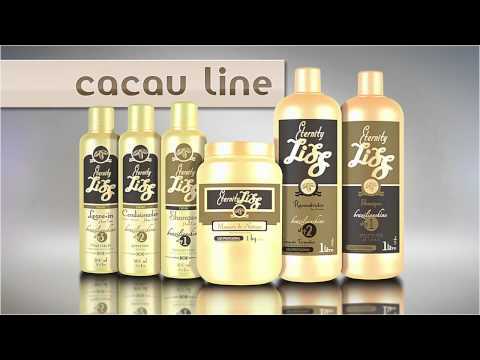 The exclusive Eternity Liss Cacau Treatment rebuilding formula is composed of keratin, designed as a stronger volume reducer & to treat and straighten damaged or curly hair in an efficient and long-lasting manner. In addition to repairing damaged hair, the product reduces volume by 70 to 90 percent, on average. The product can be used on virgin hair or may be used over other relaxing or common straightening treatments, leaving hair looking straighter and hydrated. The life of the treatment will last between 3 to 4 months using salt free shampoos & conditioners. As treatments are repeated they will last longer, hair will become straighter & condition of the hair will continue to improve. At Base of keratin, cysteine and pearl powder, the Pearl Line Stylishine reconditions proteins hair and creates a natural waterproofing against the action of enzymes and mistreatment. Treatment is safe, versatile and effective. This professional line was developed for maximum hydration and realignment capillary, providing a naturally smooth effect.